U.S. Green Building Council Releases Ranking of Top 10 Countries for LEED Outside the U.S.
Washington, D.C. — (May 1, 2014) — Today, the U.S. Green Building Council (USGBC) released its ranking of the top 10 countries for LEED® outside of the United States, demonstrating the global reach of the movement that is transforming the built environment into healthy, high-performing structures that benefit the planet and all of its people. The list of the top 10 countries for LEED reflects the global adaptability of the world’s most widely used and recognized system guiding the design, construction, operations and maintenance of green buildings. To date, project teams in more than 140 countries and territories have implemented LEED in their building projects, taking advantage of its global, regional and local applicability to create structures that mitigate greenhouse gas emissions; create healthier indoor environments for workers, students and community members; and lower utility bills for building owners through reduced energy and water use. The ranking of the top 10 countries for LEED outside of the U.S. is based on cumulative gross square meters (GSM) of space certified to LEED in each nation as of April 2014. 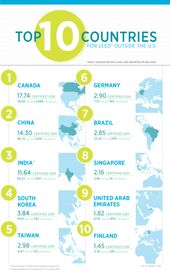 Canada tops the list, with 17.74 million GSM of LEED space. Collectively, Canada boasts 4,068 total LEED-registered and -certified projects, representing 58.66 million total GSM of LEED space. China and India, two of the world’s fastest growing economies and rapid adopters of sustainable building practices, took second and third place on the list, respectively boasting 14.30 million and 11.64 million GSM of LEED-certified space. Other Asian nations in the top 10 include South Korea, at No. 4 with 3.84 million GSM of LEED-certified space; Taiwan, at No. 5 with 2.98 million GSM; and Singapore, at No. 8 with 2.16 million GSM. In Europe, Germany and Finland secured spots 6 and 10, respectively — Germany with 2.90 million GSM of LEED-certified space and Finland with 1.45 million. In South America, Brazil stood at No. 7 on the list, with 2.85 million GSM, while the United Arab Emirates represented green building success in the Middle East, at No. 9 with 1.82 million GSM of LEED-certified space. Collectively, more than 59,000 commercial and institutional projects are participating in LEED, representing 967 million GSM of construction space worldwide. In June 2013, USGBC launched the LEED Earth campaign, offering free certification to the first projects to certify in the more than 100 countries where LEED has yet to take root. Since then, 15 projects in various nations have earned free certification, including Venezuela and Kuwait. To learn more, visit USGBC.org/LEEDEarth. The U.S. Green Building Council's LEED (Leadership in Energy and Environmental Design) green building certification system is the world's foremost program for the design, construction, maintenance and operations of green buildings. Every day, 1.7 million square feet (140,000 square meters) of space is certified using LEED. LEED seeks to optimize the use of natural resources, promote regenerative and restorative strategies, maximize the positive and minimize the negative environmental and human health consequences of the construction industry, and provide high-quality indoor environments for building occupants. LEED certification demonstrates leadership, innovation, environmental stewardship and social responsibility. LEED gives building owners and operators the tools they need to immediately improve both building performance and the bottom line. Learn more at usgbc.org/leed.